T-REX 600 - As Big As Its Nitro Brothers! The Electric RC Helicopter revolution is one of the greatest things to hit the RC scene in recent years. Where once flying helicopters indoor, flying really small helicopters and the buying cheap RC helicopter was once a dream, electric RC helicopters made that and more a reality. Finally, it doesn't cost so much to pursue this extremely interesting hobby, and the need to go to the airfield in order to fly vanished. All this means great news for beginners and those interested in this hobby but doesn't want to spend thousands dollars just yet. However, Electric RC Helicopters doesn't appeal to the experience RC helicopter pilots as much as it should. 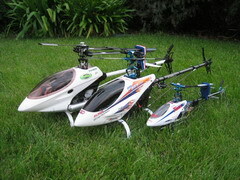 Mostly because electric RC helicopter comes in much smaller sizes and are generally less powerful. Not long ago, avid RC pilots also claim that electric RC helicopters are also slower and less maneuverable. That was true until Align launched their T-Rex 450 line - truly agile electric helicopters which are fully 3D flight-capable. So today, there is only one point left that prevents an avid RC helicopter pilot from taking up electric flights. Now, that barrier is breaking fast. Not too long ago Align introduces their new flagship, the T-REX 600. This is the first electric RC helicopter that is as big as their gas brothers. In fact, the T-REX 600 comes in size identical to .50 size gas helicopters. RC Action Thailand recently got in touch with Helimod, Align's one and only authorized dealer in the country, and got valuable information about this fantastic model. First off is the overall construction. While this model comes as big as a .50 gas helicopter, it's built with minimal weight in mind. Two versions are available, one uses aluminum and the other uses carbon fiber. As for the manufacturing quality, the T-REX 600 rates second to none. Unlike many cheap Chinese manufactured brands, this model's part doesn't need any tweaking or modifications before assembly. Most impressive is the tail rotor which comes in aluminum alloy - together with triple action ball bearings - so superbly made that the T-REX is ready for any type of flights, basic or 3D, right out of the box. The T-REX 600 also includes many accessories that usually have to be bought separately. First there is the motor - BL600L Kv, which packs ample power. Then there's the ALIGN RCE-BL75G speed controller. Next, there's the BEC 5.8 V 3 A, a converter for the receiver. Lastly, there's the receiver's battery, a 7.4 V 1100 mAmp Lithium Polymer. Many people might wonder why there's a need for a separate receiver batter since this is an electric helicopter, hence there's already a main battery. That's because this model being so big, requires a 22.2 V batteries - way too powerful for receivers. 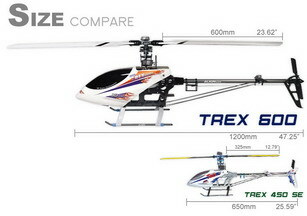 In flight, the T-REX 600 performs just as well as any gas helicopter would. According to Mr. Charnchai, managing director of Helimod, setting up this helicopter is similar to setting up gas models. In the air, the T-REX 600 behaves the same way that its gas counterparts do. Basically, for pilots who are used to flying gas helicopters, they will find that this helicopter requires very little getting used to. On the other hand, for pilots who've only flown electric versions, a few adjustments on the pilot's part may be necessary. Finally a gas helicopter experience is available for electric fliers!